Scleral Lenses: What’s the BIG deal? For the past few years, scleral lenses have been in a hot topic in the contact lens world. There are national conferences solely dedicated to learning how to fit these specialized contact lenses, there is an educational society focused on providing education to both patients and fitters about scleral lenses, and there is also a Fellowship that designates those Optometrists who have acquired extensive experience, knowledge and expertise in fitting scleral lenses. Needless to say, scleral lenses have indeed become a BIG deal! So, why is this? Scleral lenses are unlike any other contact lens on the market. They are large diameter rigid gas permeable lenses. Because of their size (14mm to 24mm), they rest on the sclera which is the white part of the eye. Hence the name “scleral” lens. The sclera has considerably fewer nerve endings than the cornea. Fewer nerve endings means less sensitivity which ultimately means a very comfortable contact lens! In fact, most patients will report that scleral lenses are the most comfortable contact lens they have ever worn even when compared to soft contact lenses. 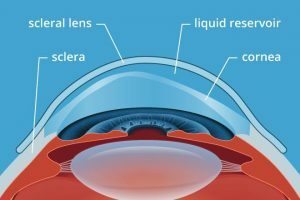 Who can/should wear a scleral lens? Technically, any patient can wear a scleral lens. But, they are most beneficial for patients who have corneal diseases, dystrophies, and degenerations (i.e. keratoconus), patients who have corneal scars and irregularities, and patients who have had a corneal transplant or refractive surgery (i.e. LASIK and RK). The common denominator for all of these patients is their corneas are altered in some way. If the cornea does not have a perfect convex or dome shape, vision will be poor through both glasses and traditional contact lenses. So, how can a scleral lens help these patients? Between the scleral lens and the cornea, there is a fluid-filled reservoir. This reservoir fills in all the corneal irregularities and creates a perfectly rounded surface. And, VOILA… most patients report the best vision they have ever experienced! The fluid reservoir can also be beneficial to dry eye patients. Dr. Kazmi will discuss this unique use of scleral lenses in our next blog.